Funeral services for Roy Raymond Goodman were held Sept. 29 at Clausen Funeral Home in Burke with Pastor Mark Tuttle officiating. Burial was in the Graceland Cemetery, Burke. Roy Raymond Goodman was born Aug. 22, 1931 on the family farm west of Naper, Neb., to William and Dottie (Green) Goodman, the fourth of eight children. Roy passed away Sept. 21, 2018 at the Winner Regional Healthcare Center in Winner, South Dakota at the age of 87 years. Roy grew up in rural Naper, where he attended country school and graduated from Naper High School. After graduation he joined the Army, where he served during the Korean War. Upon his discharge, he met and married Sara Frank on June 12, 1955 and to this union two children were born: Dewayne and Mary. Roy and Sara farmed for a few years then moved to rural Gregory, South Dakota and worked on a farm. They then moved to the Carter/Witten, South Dakota area where he worked on two different farms. They later moved to Burke, South Dakota where he drove milk truck for many years. He later went to work on road construction driving truck and as a flag person until he retired. After Sara passed he remained at home until health issues forced him to enter assisted living in Bonesteel. 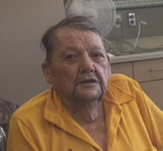 Roy then moved to the Winner Nursing Home and remained there until his death. Roy enjoyed bowling when they lived in the Carter/Witten area as he and Sara bowled mixed doubles. He enjoyed playing cards and visiting with people. When he was a flag person he would always visit with the people, finding out where they lived. He met some interesting people over the years. He was a member of the Burke VFW. Roy was preceded in death by his wife, Sara; his parents, William and Dottie; and three sisters: Reba, June and Opal. Roy is survived by his children: Dewayne Goodman of California and Mary Kaupp of Gregory, South Dakota; one grandson, Ben (Emily) and one granddaughter, Beth (Chris) Wendle; one great-granddaughter, Avery Goodman of California; three brothers: Bill (Fern) of Creighton, Nebraska; Don (Letha) of Marysville, Washington and Jerry (Janet) of Bonesteel, South Dakota; one sister, Donna (Ron) Tompt of Homestead, Montana and many nieces and nephews.